If you are one of the many fans of iPod and you like to read, you've got to check out The Cult of iPod by Leander Kahney. This is a graphics-heavy, designed, oversized paperback book of high quality. With an amazing cover photo. The price is high for a paperback at $24.95 but Amazon comes through with a 34% discount to get it down to $16.47. Which feels just right. Kahney also wrote The Cult of Mac. I like this book much better. Partly, it's the amazingly vital and current iPod phenomenon. There's a lot going on and it's fun and interesting to read about and see. Kahney writes for Wired and it shows. My favorite chapter is called I Want to Hold Your Handheld: Cultural Impact. And in that chapter, my favorite story is about an assistant professor in Marketing at the Schulich School of Business in Toronto. Markus Giesler has some interesting ideas. 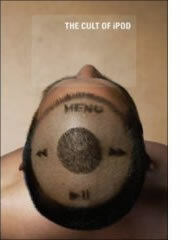 He thinks the iPod transforms listeners into "cyborg consumers". 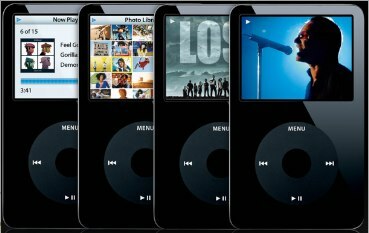 His website solicits iPod stories from volunteers for his research. "The consumer is plugged into all kinds of technologies and networks that affect consumer behavior," he said. "As a result, consumption patterns change: from materiality to information - the internet; from ownership to access - file sharing; and from pattern to randomness - the iPod." Giesler notes that jacking into the entertainment matrix changes consumption patterns. Random shuffle...isn't just a novel way to listen to music; it's one of the key constructs of digital entertainment. Giesler said that instead of trading individual songs, users are starting to trade entire hard drives: giant libraries of music or movies. When interviewees are asked how they dip into these libraries, picking items at random is the most common answer. "Shuffle mode used to be a gimmick. Now it is the most viable strategy to access information that would otherwise be lost", he said. 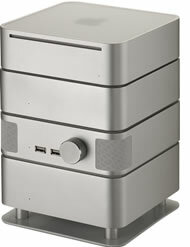 "It reduces the complexity of consumption..."
Mac mini stack = the new digital stereo? This is kind of neat. These stacking components give you a stereo system with subwoofer, 2nd hard drive and USB 2 on the front and firewire ports in the back. Looks like a digital audio system to me with the Mac mini at its core. This is just a 15 watt system, so is probably more of an office stereo. I don't know. Consumers who site improved social status as the primary reason for purchasing an iPod are likely to switch brands. No frickin' way! That's probably true in general. And would be true when applied to iPod owners except for one thing. Apple has demonstrated time and time again that they are far better at creating cool and cutting edge devices than anyone else in the computer/consumer electronics space. Sure, Sony has had success and sometimes other firms do cool things. But, Apple has the baton and they are putting the full might of their extraordinary design team behind the iPod to innovate in form and function. Steve Jobs coined the term insanely great. That's his standard. Some firms in the Macintosh space have aspired to that standard and done well. But, no one does it like Apple with Steve at the helm. He is more ruthlessly devoted to excellence and innovation and getting it right than anyone else on the playing field. And he has a VERY strong design sense that is part of the DNA of Apple Computer. I'm not saying that posers are people to be admired. I'm saying that if posers are buying cool, they come to the right place when they come to Apple and buy iPods. Apple has been moving into the consumer space of late and by now has firmly established iself as a force to be reckoned with. They've got great technologists, fantastic designers, a clear and unrelenting inclination to innovate, and passionate, full-tilt leadership. Expect early adopters and posers to remain brand-loyal. And about that Eminem ad people are talking about. The colors match strikingly. I'm not going to argue whether there was some plagiarism involved if that's even possible with an advertisement. I'm just not at all worried about it. This was Apple's ad agency that did this. And Apple will simply replace the ad with something equally cool or stand by their ad agency. If this was the one cool ad Apple ever had, maybe people would think Apple was slipping. There's no shortage of creativity at Apple. This is just a tiny bump in the road if that. You wouldn't want to see my 5G iPod right now. It would ruin the fantasy. It's still got the clear screen protector that is stuck onto it when you take it out of the box. That's not so bad except that the two bottom corners have curled up about 1/4 inch each. Not nice. But I'm not ready to remove what little protection this screen represents right now. I've got the little pouch that Apple provides. But in order to do anything with the iPod, I have to take it out of the pouch and that's when trouble might occur. I remember how incredibly sensitive my nano was to scratches. It seemed like if you just breathed on it, it would scratch. So I'm not taking any chances. I'm tempted to just keep it around in the case for now and use the nano except for special occasions. I'm worried it will slip out of my hands and fall to the ground while I'm out walking or something. I had it with me today walking downtown and back. It was in the case except for when I needed to adjust the volume. I was wishing for a tiny little scroll wheel on the top right then so I could keep it in the case. My nano has a couple scratches and I want this one to stay pristine in its beauty. Kind of like the people who keep their cars covered and in the garage and barely use them. This really is a museum piece. Too bad it had to be delicate. Now that there's a nano lawsuit about the scratches, maybe this will be the most beautiful iPod ever. Next time, they'll make it more rugged and perhaps a little less gorgeous. Or not. It is Steve Jobs after all. I'm convinced he counts public opinion at about 25% and his personal opinion at about 75%. But I have been using my iPod since I got it Friday night. I've listened to music and podcasts. I've watched a TV episode. I was surprised just how good the TV show looked on the little screen. I think this iPod will be great for short programs including 43 minute TV episodes. I would only want to watch a full-length movie under duress. I'll put a couple emergency movies on my 5G so that in case I really need that kind of distraction and have no other options, I will have them there. But this screen is too small for a 1.5 - 2 hour movie. I would get eyestrain. I tried using PodWorks 2.8.5 to copy TV episodes from my iPod to iTunes on my G5. That worked in case you wondered. Copying episodes is fast, downloading them takes a few minutes on my DSL connection. I tried watching DigitalLife TV episode 10 from iTunes on my iPod and it was audio only. Disappointing then. But now that I've downloaded the Video iPod version from their site, it's fine - all 168 megs of it. I like this. I could stick this in my pocket and listen and then take a look from time to time. I'm hoping to find a good blogger who makes it his or her business to learn this stuff find the best video material. There are full-blown TV commercials on here though. Too bad but I guess inevitable for free content. 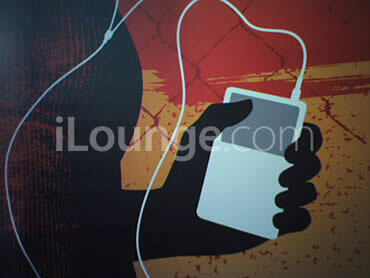 iLounge has a really thorough review but not enough real world user info for my taste. Saturday I spent a couple hours going through my iPhoto collection and cropped a lot of photos and put them in an album for the video iPod. That was kind of fun. I like doing a best of rather than putting every photo I've ever taken on there. I was expecting a bigger form factor on the video iPod. And will look forward to such a device in the future, but the pocket-sized device has a lot going for it. On-the-go, the pocket-sized device rules. The iPod is definitely an always-have-it-with-you sort of thing. Once you go beyond pocket-sized, you've got problems in that regard. Given the state of the art, I'm thinking Apple did about as well as they could. I get to have a single device that can play video when called for. If this video stuff gets really big, I'm guessing they'll do the 3“ plus device Steve talked about a year ago. New purchases. Some Music Videos. No Doubt with Gwen Stefani - Don't Speak and Sunday Morning and Coldplay Fix You and Yellow for a start. I can see collecting a few choice music videos for my video iPod. I don't watch MTV so I've never seen these videos. But I do like to see my favorite artists performing and now I can do that easily and efficiently. There are lots of and lots of music videos that are not on iTunes, though. I wouldn't mind going back in time and finding some gems here and there. By the way, I've definitely run into more iTunes download problems since the video iPod came out. Someone is downloading a lot of videos is all I can figure. Apple is probably struggling to keep up with the bandwidth requirements. Rock and roll! I took a little drive over to San Francisco tonight to make my purchase. I love that big store. It was full of people checking out the new iPods. They had a bunch on this one big table. And in the middle was about 10 black boxes just so you knew it was in stock. They didn't have the black 60 gig but I was again able to carefully compare between 30 and 60 and I decided to 30 will do. This isn't a lifetime relationship after all. I like the slimmer look a lot. I like the black. I spoke with several shoppers and employees about which to get the differences and what not. One of my biggest conversations was with a fellow shopper who was clear she wanted the 60. I was in the store for about an hour. I also made it out of there with the new universal dock and the remote control that controls the universal dock mounted iPod. I like that. Could be a great way to deploy my 60 gig 4G in the living room from across the room. Maybe I'll get some use out of my $2500+ stereo. It's worth a try. I also bought the 2-year coverage for $59 that provides battery replacement and support. I hesitated but the price seemed worth it. I love the little case that comes with the new iPod. very slick. It was probably very inexpensive and an afterthought after the experience Apple had with the nano's scratchability. It's a thin sort of artificial suede leather in white. So here I am on my black couch. I'll be watching numbers tonight with a bit of a distraction. My iPod is plugged into my powerbook right now. I'll copy over the 5 season 1 episodes of Lost that I've bought so far -- one of which I haven't seen yet. By the way, I know I could buy the whole season cheaper but this way I get to decide whether and when I want to buy an episode. I don't have to commit to the whole season which I've never seen. OK, back to my new black baby! Woohoo! I highly recommend hanging out at the SF store. It beats the Corte Madera store by a mile. Just copied my TV episodes over. And watched about 5 minutes. I'm very impressed. Very cool! Not the most beautiful nano anymore but incredibly functional. This is the *white* ezSkin for the nano. It cost me $23.99 at my local Marin Mac Shop in San Rafael. This is all they have in, but there is a black version which is displayed on ezGear's website. It came with a belt clip and wrist and neck lanyards. This is temporary but comfortable. You see a bigger version here. The translucent skin has a hard plastic screen protector that is replaceable. It also has a little bump on the back to allow for attachment of the clip in case you feel the need to show your baby off. I'm sure I'll find something I like better, but for practical protection of the nano in a case that doesn't bulk it up much, this is perfect. I just read Russell Beattie's pan of the iPod nano. He says he'll stick with his shuffle. But, to me you get so much more for your $249 than you got for the $149 that most of us paid for the 1 gig shuffle. This new iPod gives you the big iPod experience in a tiny form factor that will work great on the go when your pockets are full. There's a big difference between 1 gig and 4 gigs (300% more songs and podcasts). There's a wide gap between the shuffle's no screen and the nano's high rez color screen. And the addition of a clickwheel is priceless. Without a case, the nano is delicate, but that's a small price to pay for a such an exquisite machine. It's elevating like good architecture. I love that Apple gets crazy and takes us there. I found a little soft pouch in my junk drawer to temporarily protect my nano. So, I'm back in business! One idea I have for a case is to get one of those colored cases that Apple is going to sell in 5 packs. But I'm hoping to make a deal with someone to split a pack. Who needs 5 of these cases? Teenage girls probably but one would be fine for me since eventually I'll get something a little more interesting like the Vaja case I got for my big iPod. That case is awesome. Before I give you an update on my nano experience, I couldn't resist using this image over at Colorware. Colorware is going to be selling color nanos and will paint your nano if you send it to them. The prices are high, but we will have a few colored nanos out there, I'm sure. I hear Colorware does really good work and I like that red one! But now, back to my nano. I've actually stopped using it for the time being. I've already had two accidents with it in three days. First, while I was driving home from the store and had it sitting on the seat, things shifted on the seat due to a turn or stop and something nicked the screen. About 1/4" long on the edge, so not a big deal but it was brand new so it hurt a little. Then, yesterday, I was carrying several things in my hands as I was going from my car to the local Starbucks and the feather-light nano slipped out of my hand and fell 3 feet onto the concrete. It got a 5/8" gash on it's chrome back but was fine otherwise. I'm not exceptionally clumsy, so I'm guessing you may have this same problem. So think of this as a cautionary tale. This morning, I carried my 60 gig iPod on my morning walk downtown. It's a fine little machine and feels really good in my hand with my new Vaja red and yellow leather case. But it is probably at least 5x bigger than my nano with a similar case would be. It's fine as long as you don't want to bring lots of other devices like a digital camera, PDA and cell phone with you. I settled on bringing my Treo and my color iPod. Excellent. But, of course, I don't want to leave my nano on the shelf. It's time is now. I do want to mention that the being a two iPod person is a very reasonable, though expensive, proposition for many of us. I like having my 60 gig iPod for my full photo collection with high rez images and my full music collection. I'm syncing it to my G5 whose 160 gig internal drive has room for master iTunes and iPhoto libraries. And, I think the 4 gig nano is going to be a perfect satellite to my Powerbook. Hard drive space is at a premium on my 80 gig Powerbook. I want to make some strategic decisions about my Powerbook's iTunes so that it will stay underneath the 4 gig capacity of my nano leaving me with the rest of my hard drive space for all the other stuff I need on my Powerbook. A fairly large collection of podcasts is good. New music works. And, I've added some choice older music too. But I'm already near the limit. Remember, you actually only have 3.7 gigs to work with on the nano. But I need to protect the pristine beauty of this little marvel. I'm waiting to find a case of some sort to protect it. For starters, I just want a little pouch for starters. If I had a sewing machine, I could make one in a hurry. I was thinking that if I sort through my stuff, I may find a business card carrier that will work. I can imagine the nano fitting into a slot in a wallet too. All the local Apple store has is the armband which isn't how I want to carry my nano so that won't help (but the red armband is sharp). I'm wondering what Vaja can do with an iPod nano. They made a case for the shuffle, so a nano case can't be far behind. By the way, my local Apple store has a whole table with about 20 nanos heavily wired for people to play with. You should see the scratching on the screens of those things. They're as bad as my 3G iPod got. I wonder how they've managed to get that scratched just being looked at even by a lot of people? The good news, though, is the bright color screen makes it easy to read the screen even with a lot of scratching. That wasn't true on my 3G. It was almost unreadable. Still, I don't want that beautiful little color screen all scratched up. I am guessing we will see all sorts of cases homemade and otherwise showing up on the web in the next week. Well, surprise, surprise. 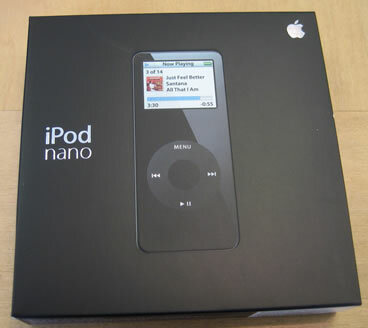 My local Apple Store got their iPod nanos today. I called the San Francisco store first and they said the nanos are flying out of the store but they had a lot of them and they didn't think they would run out if I came over later in the day. Then I checked with Corte Madera and they had some too, so I drove over. After viewing a recording of the special event on the Apple site last night, I was jazzed. Watching Steve pull the white nano out of his tiny change pocket was so cool. I highly recommend the show. One thing that was obvious, though, is that the press corp is a much more skeptical audience than the audience at the MacWorld Expo where I've seen Steve at keynotes. They didn't applaud much. First impressions: thin! So very thin, light - even delicate. It is thinner than the shuffle! About 3/4ths the thickness. It's amazing that they can fit a color screen in there and the click-wheel. Good thing it's got the chrome back to strengthen it some. More in a bit. Introducing the iPod nano. In black and white. In 2 gig for $199 and 4 gig for $249 models. Tiny and light (1.5 oz.) like a wider version of the shuffle. With color. With a click wheel. This is the *and one more thing* today. And what a thing of beauty and elegance! Just exactly what I would have hoped for after using the shuffle 1 gig for a while. I am on the waiting list for a black 4 gig model at my local Corte Madera store. They say they will have them by the weekend (I couldn't find a support group). I'm running iTunes 5 which supports folders in the Source pane on the left. A refined look is better than ever with a curved *window*. The new search bar gives you incredibly speedy and powerful search. Get what you want instantly. From my full library I typed Grassnet into the search bar and got my grassnet podcasts as fast as I could possibly imagine (I got to meet and hangout with Alan Grassia at the FileMaker Devcon last week). New smart shuffle lets you move a slider to have more or less chance to hear another song by the same artist or album than you would get with 100% random. Oh yeah. The iTunes phone got released -- finally. The Motorola ROKR E1 (check out their site) is selling for $249 with a 2 year contract at Cingular. Weighs in at 3.77 oz. Plays 100 songs. Apple thinks of it as a shuffle on a cell phone. But this shuffle has a big 176 x 220 pixel screen. Cingular has an exclusive deal for the phone in the US and has 3 great little TV ads that you can view right now on their site (and don't miss the *Make them Dance* thing - pick a person and drag a song onto the phone). When the phone rings, the music stops automatically. Music plays while you use other phone features like the calendar and phonebook. Syncs to your iTunes and does autofill like the shuffle. Now, back to the big one. The nano is perfectly gorgeous. I thought many times of getting a mini. But I didn't really like the metallic finish. 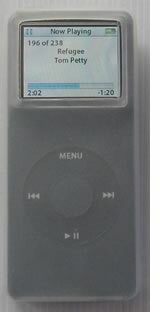 The new nano keeps to the shiny plastic and silver back of the original iPod. Except now you have the option of getting a black one which has been a wish I've had since the U2 ipods first came out. Let's go beyond white. I'm ready. Are you? I wonder what happened to the 8 gig model? Next Stevenote perhaps. Which is best for you? WordPress, TypePad, Facebook, Linkedin or Twitter? pastexpiry on Which is best for you? WordPress, TypePad, Facebook, Linkedin or Twitter?